Farewell, then, Old DLHE; your passing is unlikely to be mourned. 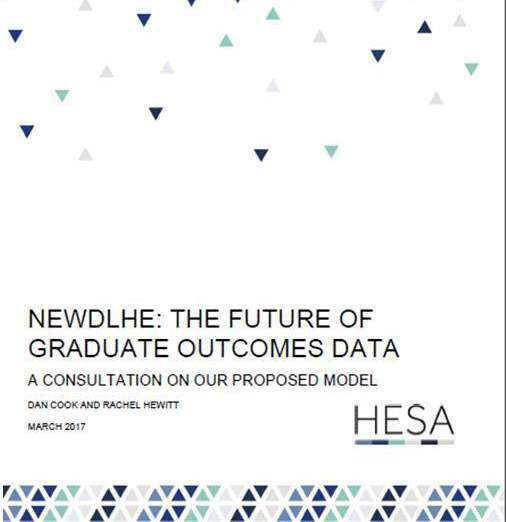 The Destination of Leavers from Higher Education survey, which delivers ‘graduate outcomes’ figures for league tables, has reached the final stages of a review. The consultation document, published by the Higher Education Statistics Agency this week, has an air of finality. The proposed new arrangements will affect students currently in their second of year of three-year undergraduate degrees. So for those of us whose departments are judged by DLHE results – which means, basically, all UK academics – it’s worth pausing to consider the proposed changes and what impact they might have. There might even be ways in which we can influence the first results, due for publication in January 2020. The principle of Old DLHE was to ask graduates what they were doing on one day, roughly six months after their graduation. As the consultation document notes, this was always controversial, and had arguably become increasingly problematic as a result of ‘the changed structure of the graduate jobs market and expectations of longer transitions into a settled pattern of activity’. Hence New DLHE proposes to ask graduates what they were doing in one week, roughly fifteen months after graduation. This feels right, and should produce more reliable data. Notably, there’s a provision that will still capture those on twelve-month MA programmes (‘graduates who are surveyed in the September – November period will be asked about the activities they were undertaking during the first week in September’). While these programmes are not always the best way to ensure long-term employability, this commitment will be welcome in the sector. As well as surveying the levels of graduate employment, New DLHE will gather information on salaries. The methods for this investigation remain just a little bit of a work in progress, but will involve a combination of self-declaration in survey-interviews and figures drawn from existing national datasets. We’re not unfamiliar with these kind of data. They tend to show that if you study economics at the LSE you’re going to make money, and if you study ceramics you’re probably going to make rather less. For most disciplines in between, meanwhile, the average figures tend to be more closely bunched. So I’d put this in the category of: ‘bound to happen, nothing much to be done about it’. My only concern would be the potential uses of the figures. Given the accepted correlation, regardless of one’s degree, between social background and future earnings, one hopes they are never worked into league tables. Why did you decide to take up your job? This promises to give us some fascinating data, reflecting in particular on the ways in which graduates understand the place of their degrees in their unfolding lives. Universities will also have the opportunity to add further optional questions. A year ago I facetiously suggested calibrating DLHE with a national happiness index; HEFCE has opted instead for ‘meaningfulness’. These questions might also prompt academics to think afresh about how we help our students make connections between their learning and their future careers. If Old DLHE has encouraged a utilitarian approach to employability – just getting graduates into jobs – this is altogether more idealistic. But how will these questions be made to matter? I’ll be watching to see whether responses end up being factored into league tables. If this doesn’t happen – and it’s not obvious to see how it would – then their effect will be limited. They could even come to be seen as more trouble than they’re worth. Entrepreneurship is the new black on UK campuses. Hence the predictability that the definition of ‘graduate employment’ in New DLHE would be adjusted accordingly. It will aim ‘to capture graduates pursuing non-traditional career-paths, such as those developing creative portfolions or setting up businesses’. That will be welcomed in particular by academics in creative disciplines, who have argued that Old DLHE fails to recognize the more dynamic and entrepreneurial routes taken by many of their graduates. But the calibration with earnings data may well cut in the other direction, exposing areas where ‘entrepreneurship’ often boils down to taking bar-work while struggling in vain to get a creative career off the ground. Kind of. Response rates of 70% per provider are predicted on the basis that they do something similar in Australia and get 39% – but, hey, we’ll do it better. That smacks just a little of wishful thinking. I’ll also be curious to see whether some of the idealism – and length – gets whittled away somewhere along the line. But hopefully this is pretty much what we will get; it looks like a better destination than Old DLHE.